This tagine recipe is my absolute favourite meal, and I’ve been having it for my birthday dinner for more years than I can count. I love the lightly spiced lamb, the sweetness of the figs and the crunch of the almonds. I cut the figs into halves rather than quarters as they hold together during the cooking and look better when served. It also works well with apricots, peaches or nectarines instead of the figs. Serve with bulgur or couscous. 1. Heat the olive oil in a heavy saucepan, then fry the lamb and onions over a medium heat for a few minutes until they are brown and the onions are starting to stick to the bottom of the pot. 3. Then add the water and quickly stir it through. 4. Add in the salt, tomato purée and almonds and leave to cook, covered, over a low heat for an hour. 5. Add the honey and figs and cook for another 25 minutes or until the lamb is tender and the stew has thickened. 6. Taste and add a squeeze of lemon juice if it’s sweeter than you like or a bit more honey if you’d like it sweeter. 7. Remove from the heat and garnish with yogurt, mint and coriander. Born in Detroit but raised in County Clare Theresa Storey now lives in rural County Limerick where she puts her Botany degree to good use growing fruit and vegetables and managing the family orchards and woodland. 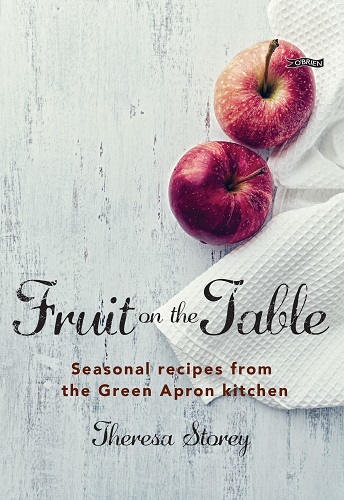 She uses the fruit of her labour to make fabulous preserves for her company The Green Apron which has won many national and international food awards. She also teaches sustainable living, blogs and tries to keep up with her three kids. From Fruit on the Table by Theresa Storey, published by The O’Brien Press. Priced €19.99/£16.99, available from all good bookshops now.